Well, obviously. I heart the butter. Poor Laura. She only eats healthy food. Her life must be so boring. Her food must be so bland. 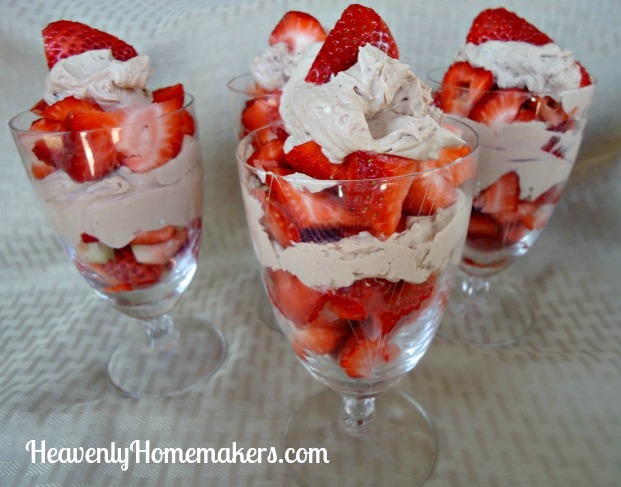 She is stuck eating food like this Chocolate Cheesecake Strawberry Parfait. We must support and encourage her in every way we can. Have you ever thought about this? About how real food is so delicious? About how rich and nourishing and tasty it is, and about how there is so much variety? About how you can make so many simple dishes with just a few simple, real food ingredients? 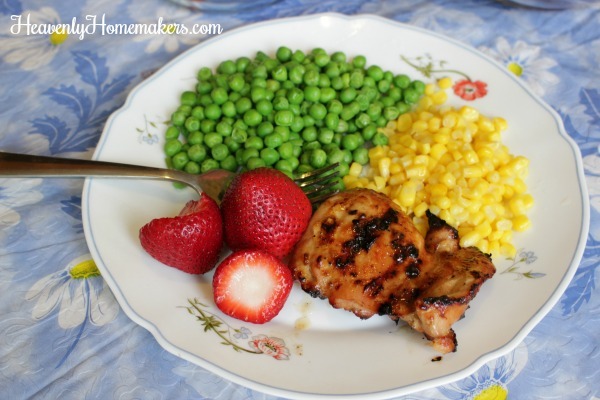 Don’t look now, but grilled boneless chicken thighs are one of the most flavorful, juicy meats you can eat. Add a few simple fruit and veggie side dishes and you are also eating like royalty. I encourage you to think through your list of favorite real foods. Beware: It is more difficult than you would think. I had a tough time stopping at 10 because as I started making a list, I kept thinking of more food that I love! By the way, if you haven’t downloaded our free printable Simple Ingredients for Simple Meals list, you need to go grab that! It’s a super helpful resource to remind you of all the basic real food options that are great to keep on hand so you can mix-and-match them to make thousands of real food meals! 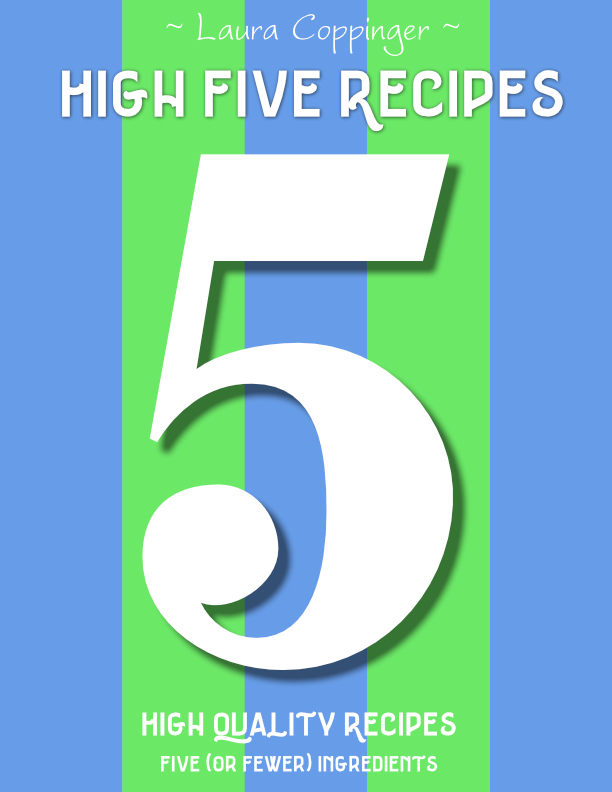 Also, you will love our High Five Recipes eBook. It’s full of 111 simple recipes, all of which call for 5 or fewer real food ingredients. Amazing! Number 10 was a toss up between asparagus and okra. Also zucchini or fresh sweet corn. Ahhh, eating real food is a happy place to be. Now true confessions: There are some real foods I don’t love. Even the least picky among us has something we don’t like, right? So here’s my other encouragement for you. Let go of the real food you don’t like. We live in a world with incredible variety. Eat the hundreds of real foods you DO like and let go of guilt over the few you don’t like. I’ve learned that the world did not stopped spinning the day I admitted to myself that I don’t like jicama. Jicama – no matter how hard I tried. Hot Peppers – I cry enough without help from a pepper. Pickles – in any form. Olives – I just can’t. Bananas – because of the texture. Now go get this free printable list to use as a wonderful real food ingredient reference! 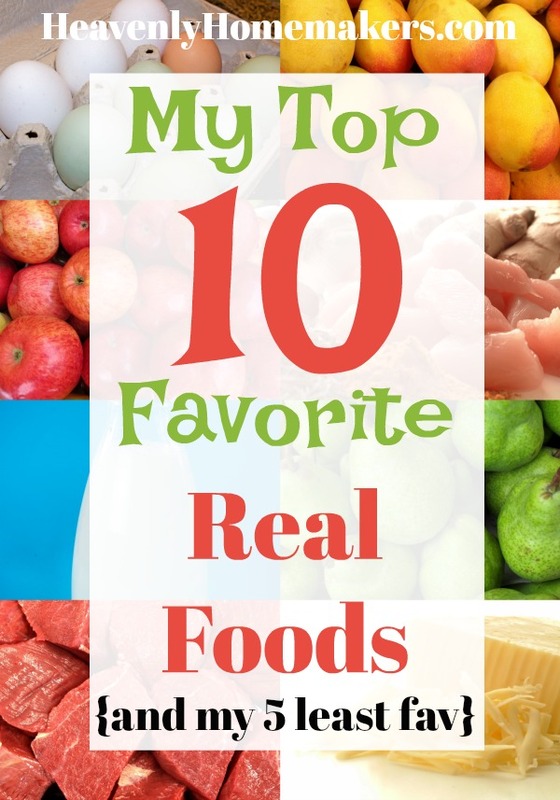 And leave a comment to share your favorite and least favorite real foods! I love your list. Especially the butter part. I’m (wickedly, I admit it) feeling glad you didn’t include Kale on your love list. I hate it, hate it, hate it. I know I should love it, based on all of the recipes and articles out there praising this “amazing superfood.” But it’s bitter and gross and I don’t want it anywhere near my smoothies thankyouverymuch. Interesting that you mentioned jicama. Recently, my husband and I completed some time on a (very healthy, real food) diet plan, and during one phase there were limited types of veggies allowed, and jicama was one of them. I looked up the description and it sounded promising, but no matter how many local grocery stores I searched, I could find none. Considering it’s #1 on your “dislike” list, maybe I should just cut my losses and let it go! I did re-discover how much I love fresh fruit and berries, especially with homemade REAL whipped cream! And baked goods with zucchini and cocoa are divine! I found a deal on some grass fed beef at one market, and those were the BEST burgers! Real food rocks (but a little sugar makes me happy, too). Pickles, olives, and (raw) bananas are on my least-favorites list as well! But my hubby and my kids love all of them. So we buy real food pickles (thank you Aldi, for making pickles with no artificial anything!) and I’m thankful that they are one of the few vegetables that ALL of my kids will eat without complaint.